Production of hot metal at the Blast Furnace No. 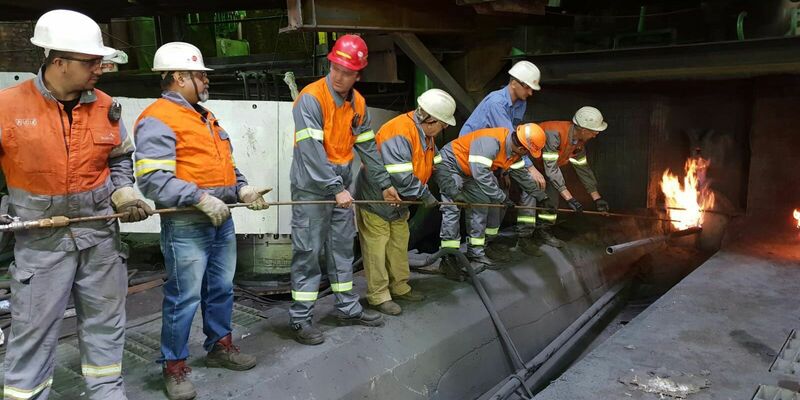 4 operated by ArcelorMittal Zenica plant in Bosnia and Herzegovina was successfully restarted after a comprehensive rebuilding. The contract for the project was signed by ArcelorMittal Zenica and Danieli Corus in early 2017 as part of a modernization program for the plant that also included upgrades for downstream as well as upstream facilities. The 2000-m³ Blast Furnace was rebuilt according to its existing design from the tuyere belt upwards. The hearth was revamped based on a new design by Danieli Corus. The project scope also included repairs to parts of the hot blast system and cast house, as well as upgrades to the Furnace’s process instrumentation. The rebuilt Furnace will produce an annual output of 1.1 million tons of hot metal, with substantial headroom capacity accommodated for in the design. CEO of ArcelorMittal Zenica, Mr. Biju Nair, said, “We love these steelworks, and the truth is that we feel insecure when the Blast Furnace is out of operation. Today, we are particularly pleased, and in the next 15 years the Blast Furnace is to provide steel production and new workplaces as well. I would like to thank the management of ArcelorMittal who started this project in these rough times,” said Novalić.